See all the info you need in the screenshot above. This time I’ll be able to do it. I didn’t get to do it last time because we had a freak blizzard come in and bury the city, shutting down everything. Even though Dialga was weather-boosted at the time, there was just no way. I intend to target the EX Raid stops in the area. Beyond that, nothing else. I have my 96% one already after all. Again it is during my workday and I can’t leave the facility. Still not interested. It doesn’t matter which Legendary it is. I’m only gonna do one raid using my free pass (so basically what I do everyday). 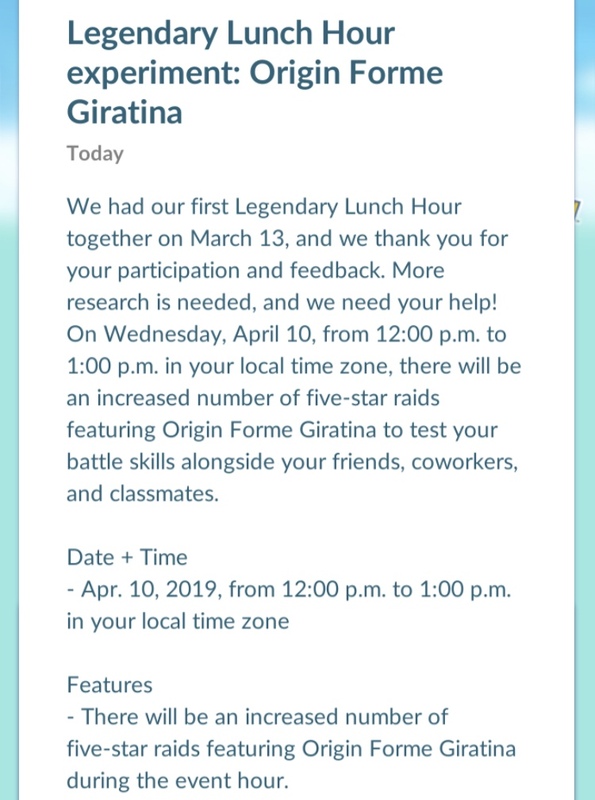 They should definitely give us 5 free pass for this event if they want to improve it and have more people participate. My opinion about legendary lunch hour hasn’t changed since last time. It’s a nice idea for the target audience, and those who can’t play won’t miss anything, so there’s no need to complain. If I’m lucky, I can get some people together to do 2 or 3 raids. If not, I’m still OK with it. I haven’t lost hope Niantic will add something (maybe next time), be it a number of additional raid passes (even one more would be ok), double raid stardust or something small like this. @Necrozmadabest The point of these lunch hour raids isnt to give people a chance at raid trains. Its to give people a chance to do a raid. So theres no need to give people multiple free passes. It would actually be more upsetting cause most people wouldnt have the time to use them, so they would be wasted on them. Also what do you mean by “increase minimal IV to 33”? Minimal IV from raids is 67% (10/10/10). If you mean on wild spawns, that would defeat the purpose of a 0-100% scale. And its not like a 33% is that much more worth putting stardust in than a 0%. Some people actually go hunt for those, as they are they are more rare. 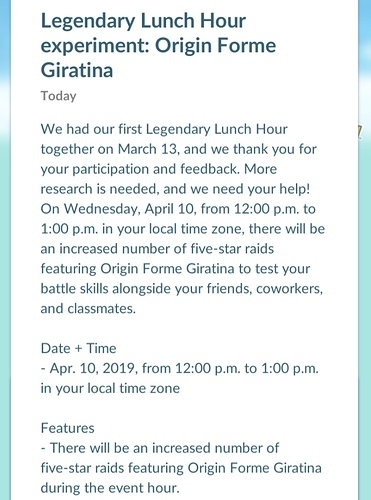 I like the lunch hour raid idea, so as far as im concerned, they listened (this time). 33%*45 = ~15. So that could be 5/5/5. Free stuff is always better ofcourse, but you cant run a company on it. The service here is that you guaranteed have a raid at a certain time, so you can plan your raid a week ahead. You wanna do more, you can save your pass from the day before or use coins. And they listened by doing it again. Im one of the people who enjoys this, and i let them know. I hope more days like these will follow. I understand what you’re meaning there with the 33IV’s, but I think 11/11/11 is more clear to me. I did also think you meant 33% IV at first. On Friday it would’ve been better for me. Millions of users. Is it possible that the improvement you wanted might not have been wanted by a majority of them?